I have Peter Pan Syndrome! I still play with barbies and stuffed animals! Every time a friend comes over I hide them because I know that’s not what they like. I wish I could be like this forever, but everybody at school already hates the things I still like! I think I love being a kid but I’d love being an adult more than a kid because I’d get to live without anyone telling me what to do. I like being a kid and I’ll enjoy it while I can before I’m all grown up. My fav part about being a kid is going to school and getting to read dork diaries books at school during read to self Time because well u know why. IM A TOTAL DORK!Sometimes I’ll read when I shouldn’t be because they’re so good and that’s why I like being a kid and an adult. The best part of being a kid is being pampered all day,like me! And the best part of being a adult is that i can go anywhere myself!! !But personally, i prefer to be a kid and i am glad that i am. SQUEE!!!!!!!!!! I’m TOOOOOOOO matured they say sometimes and sometimes really IMMATURE!!!!!!! its okay, you dont even have to leave the house if you dont want to. plus think about what you can do as an adult, you get to go pretty much where ever u want. PS MLP Lover, i still watch my little pony also. I definitely have Peter Pan Syndrome- I still watch MLP! My advice is that If you’re friends are embarrassed of you writing in your diary then your better off without them. You can do whatever you like coz you are you! Be yourself! Don’t care what other people think! it’s okay, i think that everyone just wants to have fun all the time but rules are rules, and they’re there to keep us safe! Its so werid how when you’re little you want to grow up or be a “big kid”. But then when you’re older or realize how the life of an adult is you dont. 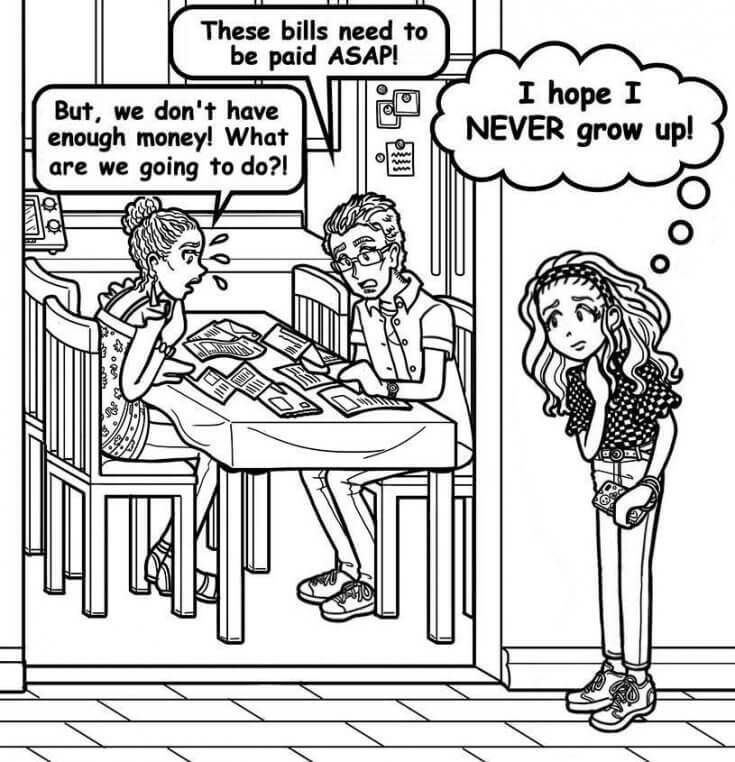 I have the same prob!The reason I don`t want to grow up is because eventually you`ll die!!! !It just creeps me out. Sometimes, the best option is to face your fears. Life will never stop for you, you have to accept that. Things will change, and so will people but together you can get the job done. Don’t be scared, because you know what? there will always be someone there for you, no matter what may happen. Even if you don’t think they are. everyone will have problems, it’s how you DEAL with it. Like Nikki said, cook more for your family! Te best way is to start with lunch at as you get older do more experienced cooking. I’m 11, and I can make a cup of tea for my parents and make a 2 course lunch! Trust me, its SUPER FUN once you start. You’ll be BEGGING to cook for your parents in no time, I PROMISE! Don’t worry. OMG! Everyone Has to!!!! I feel the same way now but after reading this I know I,m not alone. I really don’t want to grow up. My favorite part of being a kid is doing fun things no matter what people think. I think the best part of growing up is being able to drive! i literally felt THE SAME WAY before i saw this. it felt so good to read this and feel better about getting older. thinking about growing up is hard for me. it feels good to know that growing up is a process that feels like forever. cause i dont plan on going anywhere anytime soon! The best part about adults is that if your a kid and your on a diet that you hate you can quit the diet!! And the best thing about being a kid is that you get candy on Halloween!! !